Eschewing the airline name save for the 2 letter CX, Cathay keeps the understated bag mien which they've been known for. 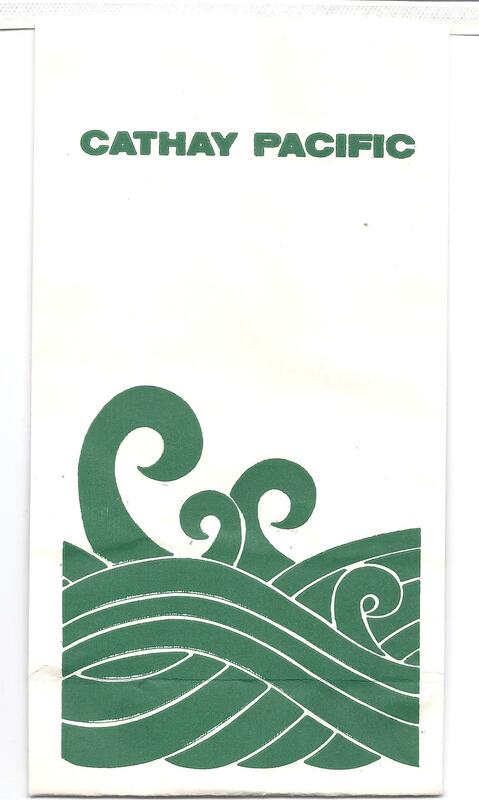 The turbulent waves on this bag, reminiscent of a roiling sea or the contents of your stomach, looks like a swirlie precursor. 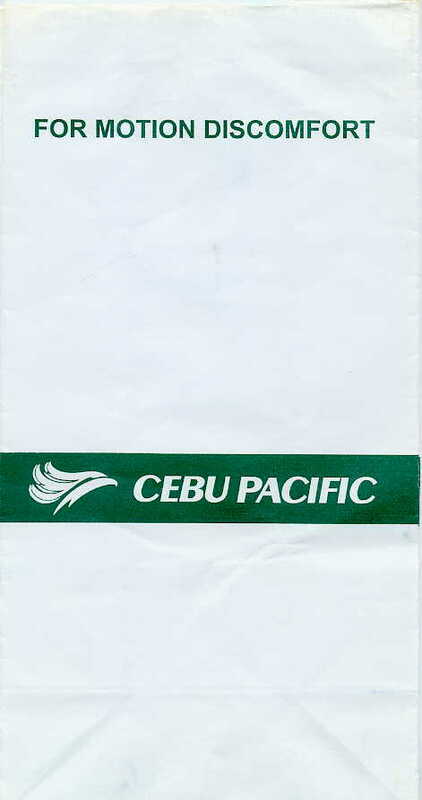 This bag completes the triumvirate of the Red, Blue and Green bags Cathay released during this era. 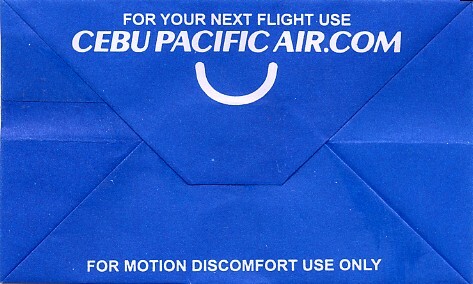 This is the only bag that actually shows an injured passenger. I'm not exactly sure how motion sickness requires bandaging around the forehead. Maybe the tiny plane in the background had something to do with it. If you want to see a sea slug wearing a wig, look no further. 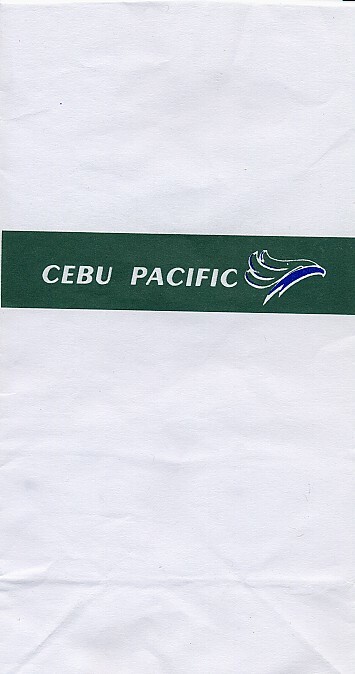 Cebu Pacific eliminates blue from its color scheme. How bold of them! I'm just guessing the vintage on this bag is 2002. Who really knows? 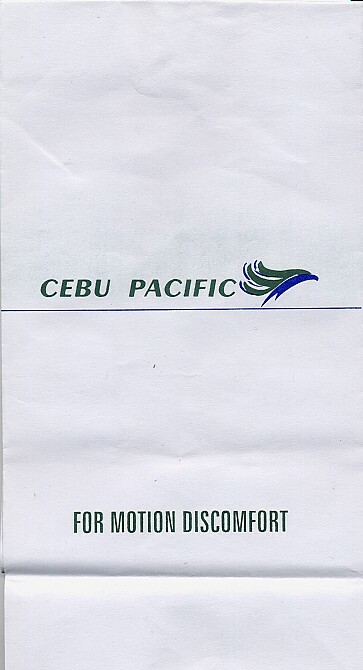 Much like Cebu Pacific's earlier offering, except the logo is now on the left rather than the right. I'm just guessing the vintage on this bag is 2004. Who really knows? 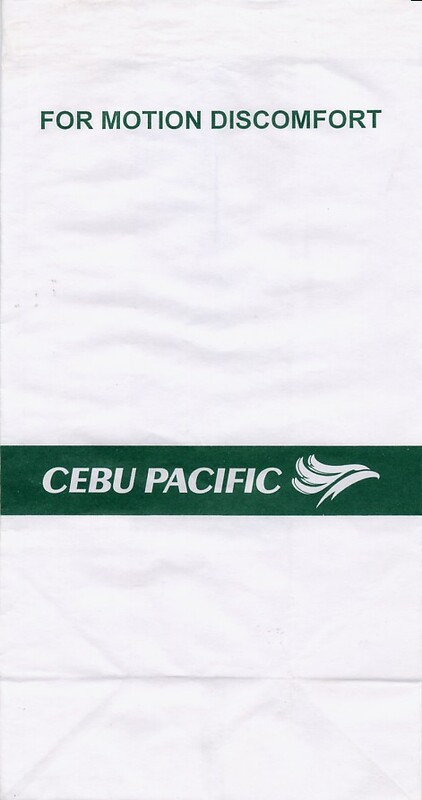 It's the smae happy plane with a moustache and an American football helmet (if you think the Cebu Pacific logo looks like a moustache, that is). 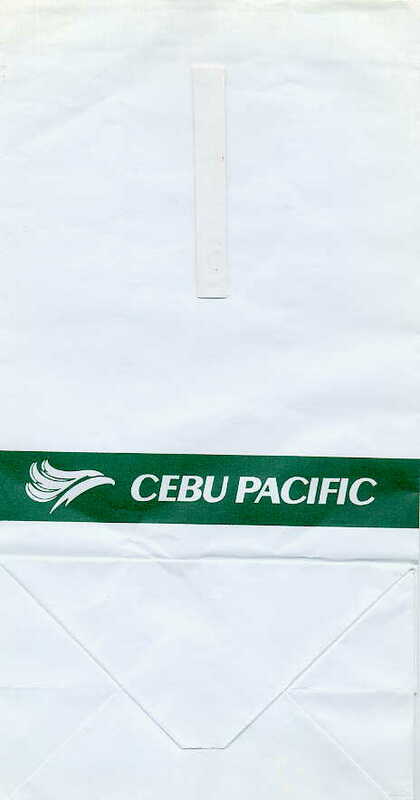 This bag was updated for 2008 by adding the text, "Save the Earth. 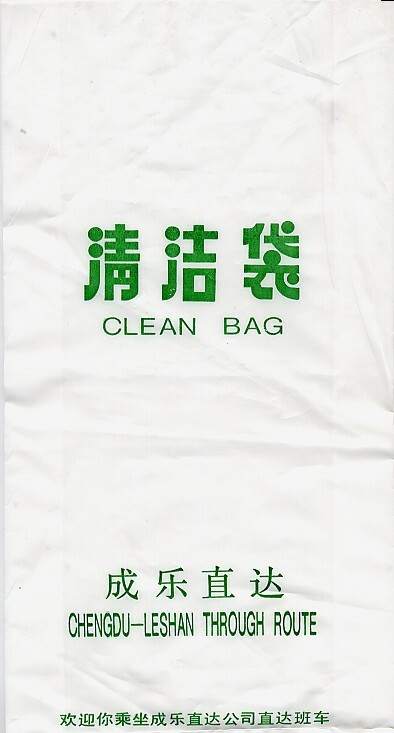 Use this bag only when necessary". 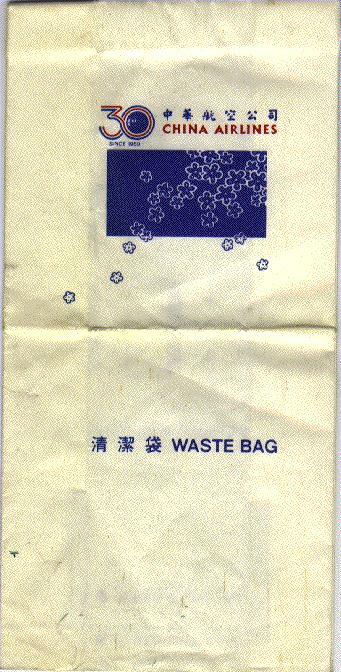 I think they mean that you reduce waste by only using the bag to throw up in, and not as a hand puppet or whatever. 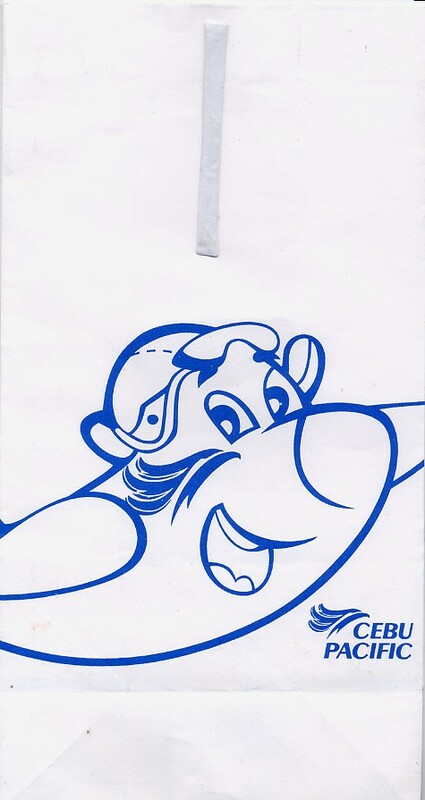 Great cartoon plane wearing an aviator's cap that wants you to somehow save the Earth by barfing. 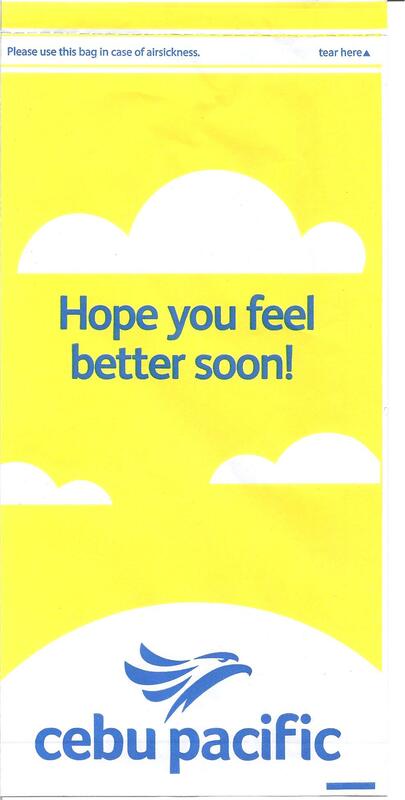 This bag says "Hope you feel better soon!" and has clouds and the Seattle Seahawks logo. 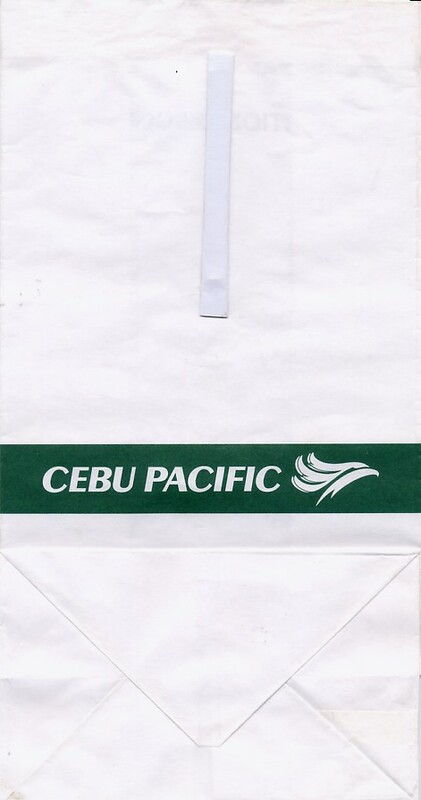 This bag is a product of a British Reality TV Show where celebrities were instructed to start and run their own airline. This bag is just part of their efforts. 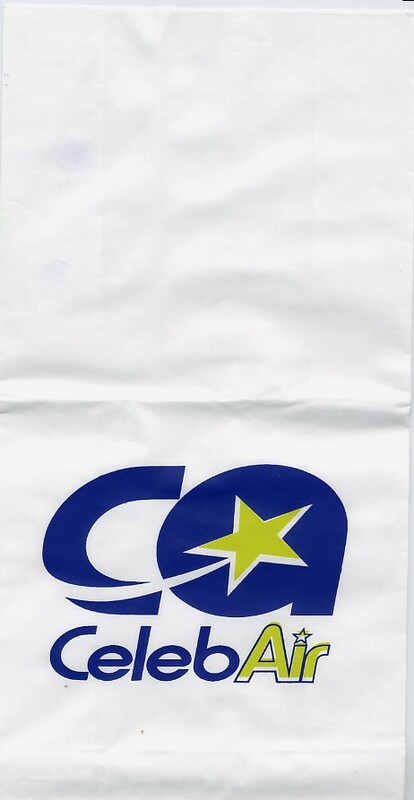 Not a capital letter to be found on the front of the bag. Interesting font though. 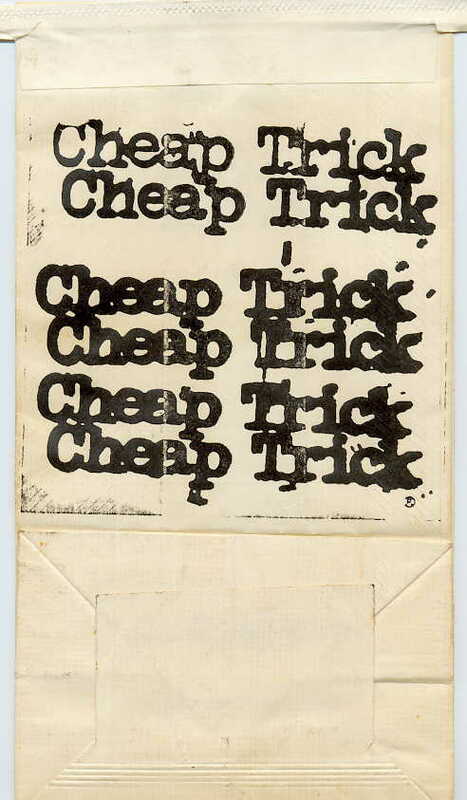 "If rock music is a big part of your life, make Cheap Trick a part of your rock. They do it right! Rock hard!" recommends this excellent bag. 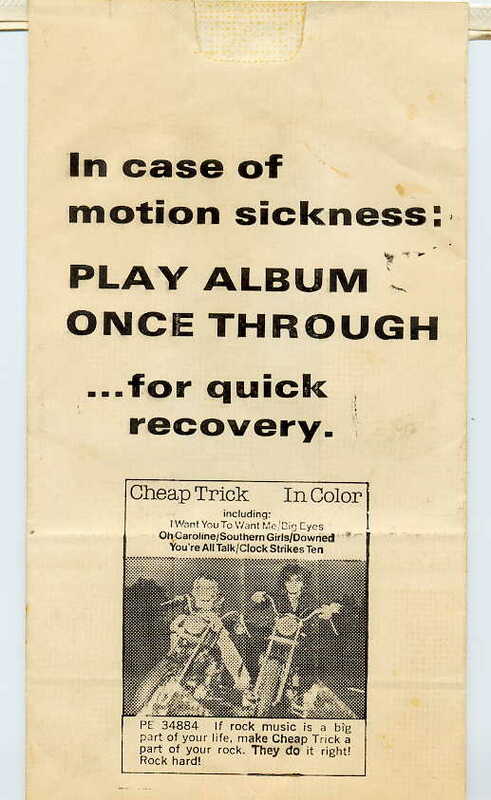 It also bubbles, "In case of motion sickness: PLAY ALBUM ONCE THROUGH ... for quick recovery. 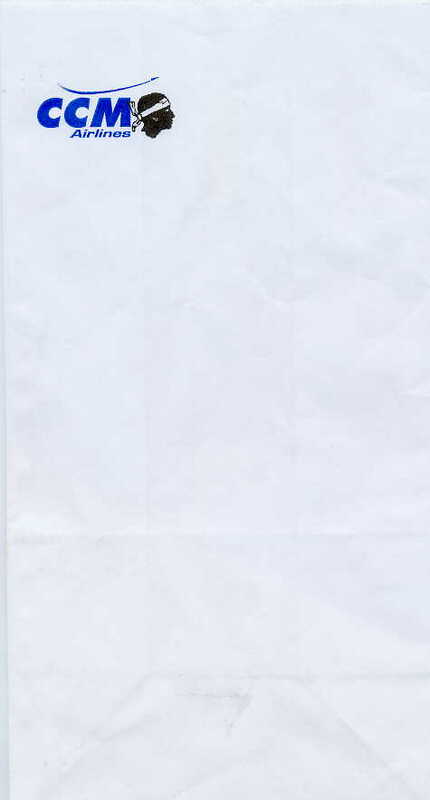 The bag was produced for the Cheap Trick In Color album (with hit I Want You to Want Me), but note that the bag is monochrome. 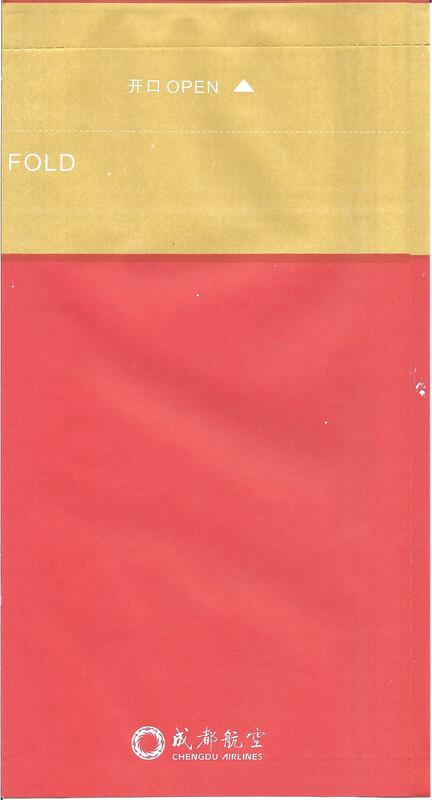 The colors on this bag are reminiscent of a Chinese restaurant. One other thing to note is that their logo is the same as Lucent was. Guess what? A bus (!) 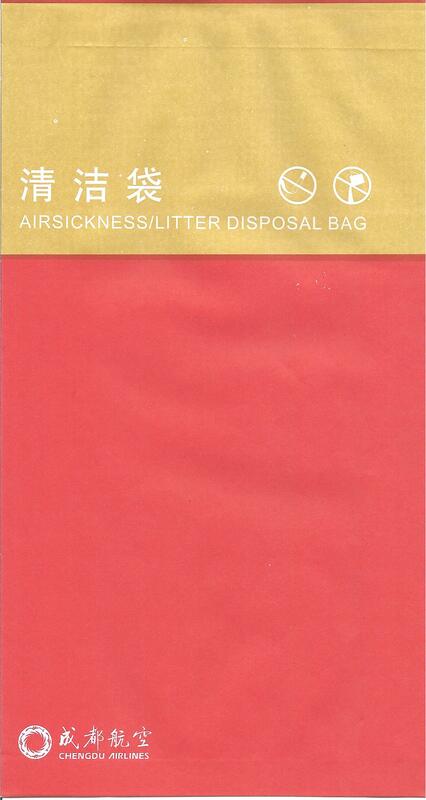 sickness bag. It's a rare bag found only on the Chengdu-Leshan through route in China. 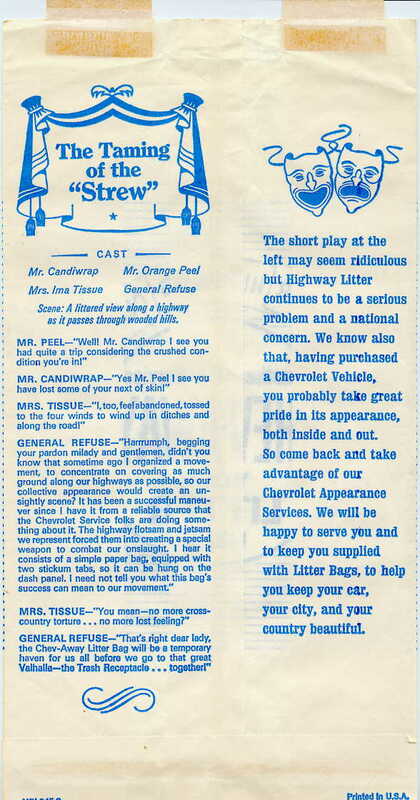 While I admit this is really a litter bag more than a car-sickness bag, you really need to check out the copy printed on this thing. 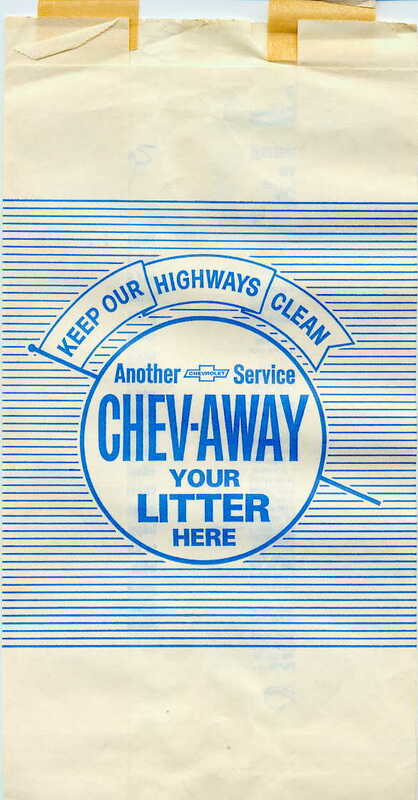 It's an anti-litter message, which is pretty cool, but it has to be the most moronic pabulum ever printed. I mean they have a 4 character dialogue with a Mrs. Ima Tissue, Mr. Orange Peel, Mr. Candiwrap, and General Refuse. It's more moronic than the Snorkel Bob bag, but at least Snorkel Bob is intended to be that way. A beautifully colored green bag to match beautifully colored green puke. 30th Anniversary edition, for bags that like to celebrate that sort of thing. The logo on this looks like the output of the computerized life generation simulator. Ill advised use of English language on back of bag seems to indicate that bag should be left open AFTER use. Also, do not adjust your screen. 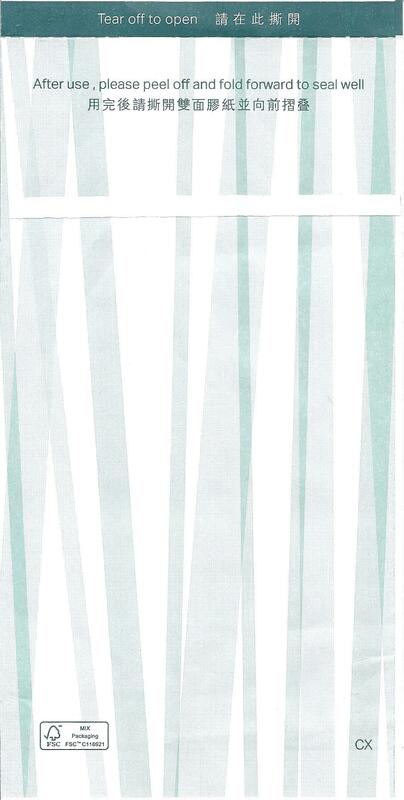 The back (or the striped front, depending upon your perspective) is printed upside-down.